Welcome to Workshop Arts Inc. Participation in Theater Workshop is open to children in all surrounding schools and communities. Contact Stacey Fix to learn more! Congratulations on a fantastic performance of The Mermaid and the Merrimack! Show DVD and Photos are now on sale. 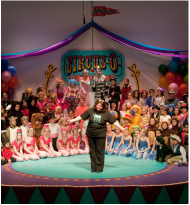 ​20 Years of Professional Children’s Theater Productions. We invite you to become a patron of our program and Celebrate 20 with $20! Please include how you would like your name to appear on the page as well as your contact email. For information about and to register for our Intern Program for Middle and High School Students, click HERE. Congratulations go out to Sam Bell, Senior Intern! ​His article, podcast and video about Theater Workshop was selected as one of the best out of 5,000 other schools and made "Best of SNO". Each week, the company that hosts the Triton school newspaper website selects the best student work from all over the U.S. for its national edition. Check out Sam's work HERE. 2018 Newburyport Yankee Homecoming Parade! Participation in Theater Workshop is open to children in all surrounding communities. We welcome participants from Newbury/Byfield, Salisbury, Rowley, Newburyport, West Newbury, Georgetown and beyond. We offer an Introduction To Theater class for children new to theater and acting. This program is for grades 1 and up. No auditions are necessary to participate in our Theater Production program. All abilities are welcome to join and participate in our stage production. This program is for elementary students up to grade 6. Check out or show archive page!